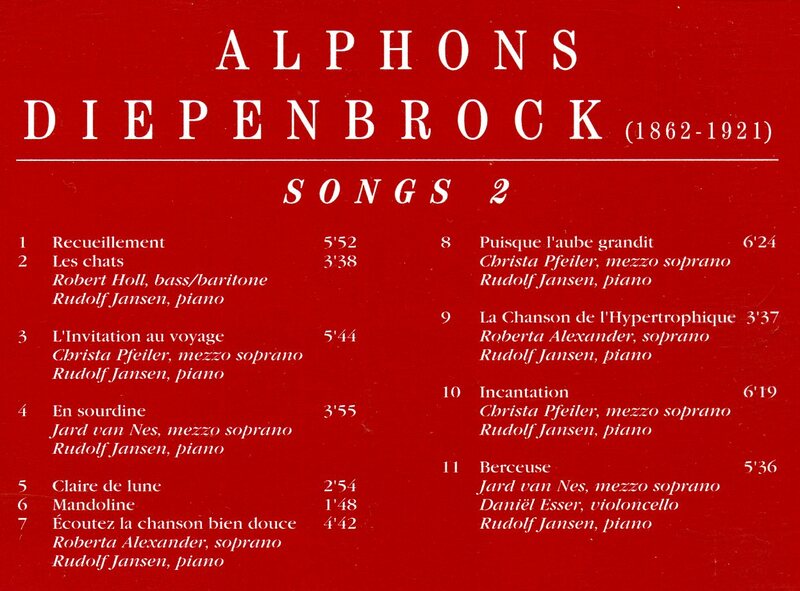 Diepenbrock composed his Berceuse for mezzo-soprano, cello and piano in October 1912 as a present for his friends Gérard and Julie Hekking-Cahen on the occasion of the birth of their daughter Françoise. A few months earlier, on 25 June, Hekking – since 1904 the leader of the cellos in the Concertgebouw Orchestra – had given an excellent performance of the solo in the last movement of Diepenbrock’s incidental music to Vondel’s Gijsbrecht van Aemstel (RC 108). In 1909 his wife Julie had premiered Mandoline (Mandolin, RC 99). The couple had a cordial relationship with Diepenbrock and his wife. At the suggestion of Elisabeth, Diepenbrock first attempted to write an instrumental lullaby. When that did not work out, he was inspired by a poem (without title) from van Lerberghe’s La chanson d’Ève (The Song of Eve) which Johanna Raphael-Jongkindt had sent him not long before. On 26 October he started a sketch and four days later, on 30 October, he had completed the composition. On 1 November a neat copy was delivered to the Hekkings as a present. They were so delighted with it, that they visited the composer to play through the work that very same evening. It has not been documented whether or when they performed it in public. Possibly the performance in Zaal Heystee in Amsterdam on 8 May 1916 by the mezzo-soprano Berthe Seroen (1882-1957), the cellist Marix Loevensohn (1880-1943) and the pianist Hans Franco Mendes (1890-1951) was its actual premiere. The poem expresses the advice the Lord gave to the human child in the earthly paradise: Walk through the garden of the angels, full of light and innocence, where apples and roses shine; it is yours, it is your kingdom. But pick only the flowers, leave the fruit on the branch. Do not look for the mystery of life. Do not listen to the enticing voices of the snake or the sirens, or to the lure from the dark boscages of love. Remain ignorant, do not think. Sing! All knowledge is useless, just take pleasure in beauty. Let it be the whole truth for you. Diepenbrock considered the poem charming, sonorous and not at all unmusical . 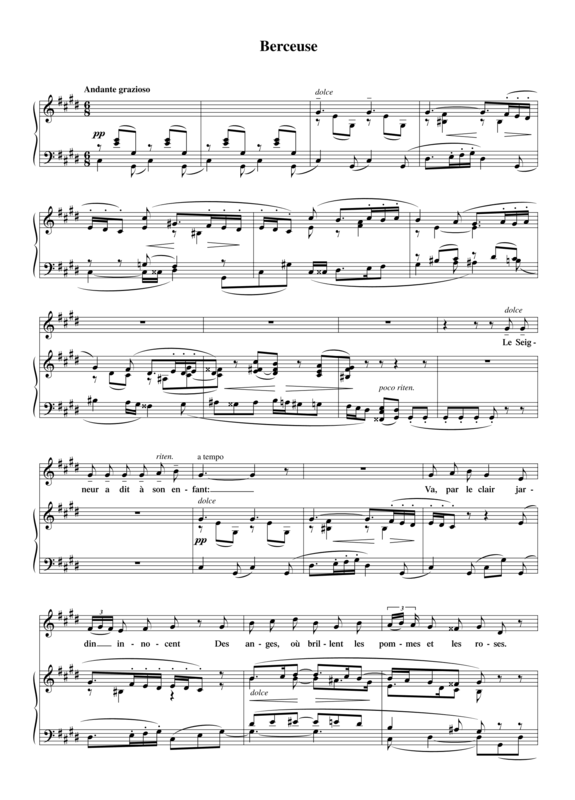 (BD VIII:54) With his setting in a 6/8 metre, flowing melodies and harmonies that flexibly adapt to the lightness and seriousness of the text, he turned it into an appealing lullaby that has maintained its charm to this very day. It concludes with a long hummed garland. Especially the version with only piano accompaniment (RC 112) was popular, but the original setting was also performed in public, e.g. by Elisabeth Simons (1886-1971), the cellist Charles van Isterdael (1873-1962) and the pianist Hans Goemans at a special soiree for the Dutch Red Cross and the committee for Belgian war victims in the Royal French Theatre in The Hague on 3 December 1917. Des anges, où brillent les pommes et les roses. Il est à toi. C'est ton royaume. Aux bosquets sombres de l'Amour. Et qu'elle soit pour toi toute la vérité. Are resplendent. It is yours. Your kingdom. Do not seek too much happiness. And the riddle of mankind. May it be all the truth you need. 10 jul 1918: Uitvoering van de Berceuse in het Kurhaus te Scheveningen door Tilly Koenen met begeleiding van Hans Goemans en Charles van Isterdael (cello). Voorts liederen van Zweers en Van den Sigtenhorst Meyer, alsmede orkestwerken van Haydn, Bruneau en Wagner gespeeld door het Residentie-Orkest onder leiding van Rhené-Bâton. Diepenbrock's Berceuse – een subliem gedicht van den Belg Van Lerberghe – werd naar ziel en techniek zeer schoon gezongen, maar de meest absolute zelf-negatie en ontroerende charme van een... neen, geen namen noemen, kon de zangeres mij niet doen vergeten. Als ik de liederen van Diepenbrock mij bekend, zoo naga, is er geen, waarin bekoring en verdieping zóó samengaan, opschrift (Berceuse) en wijde, verhoogde idealiseering van de gedachten, zóó zuiver en harmonisch-schoon zijn uitgedrukt, als in dit verrukkende lied, waarin de cello-stem niet alleen raison d'être heeft, maar van een, het geheel wonderlijk-verhoogende expressiviteit is. Van Isterdael gaf er zijn welluidendste en innigste cantabiliteit aan.